43:0.4 The supervisor seraphim, the third order of local universe angels are assigned to the service of the constellations. They make their headquarters on the capital spheres and minister extensively to the encircling morontia-training worlds. In Norlatiadek the seventy major spheres, together with the seven hundred minor satellites, are inhabited by the univitatia, the permanent citizens of the constellation. All these architectural worlds are fully administered by the various groups of native life, for the greater part unrevealed but including the efficient spironga and the beautiful spornagia. Being the mid-point in the morontia-training regime, as you might suspect, the morontia life of the constellations is both typical and ideal. 43:2.4 All judicial problems are first reviewed by the council of the Melchizedeks. Twelve of this order who have had certain requisite experience on the evolutionaryplanets and on the system headquarters worlds are empowered to review evidence, digest pleas, and formulate provisional verdicts, which are passed on to the court of the Most High, the reigning Constellation Father. The mortal division of this latter tribunal consists of seven judges, all of whom are ascendant mortals. The higher you ascend in the universe, the more certain you are to be judged by those of your own kind. 43:4.5 The residence of the Faithful of Days on Edentia is located to the north of these residences of the Most Highs and is known as the “mount of Paradise assembly.” On this consecrated highland the ascending mortals periodically assemble to hear this Son of Paradise tell of the long and intriguing journey of progressing mortals through the one billion perfection worlds of Havona and on to the indescribable delights of Paradise And it is at these special gatherings on Mount Assembly that the morontia mortals become more fully acquainted with the various groups of personalities of origin in the central universe. 43:4.8 That the teachers of olden times knew of these things is shown by the record: “And there was a day when the Sons of God came to present themselves before the Most Highs, and Satan came also and presented himself among them.” And this is a statement of fact regardless of the connection in which it chances to appear. 1. The Constellation Father. The present Most High ruler of Norlatiadek is number 617,318 of the Vorondadek series of Nebadon. He saw service in many constellations throughout our local universe before taking up his Edentia responsibilities. 43:6.3 Centrally located in this magnificent garden is the worship shrine of the Most Highs. The Psalmist must have known something about these things, for he wrote: “Who shall ascend the hill of the Most Highs? Who shall stand in this holy place? He who has clean hands and a pure heart, who has not lifted up his soul to vanity nor sworn deceitfully.” At this shrine the Most Highs, on every tenth day of relaxation, lead all Edentia in the worshipful contemplation of God the Supreme. 1. Live happily and work effectively with ten diverse fellow morontians, while ten such groups are associated in companies of one hundred and then federated in corps of one thousand. 2. Abide joyfully and co-operate heartily with ten univitatia, who, though similar intellectually to morontia beings, are very different in every other way. And then must you function with this group of ten as it co-ordinates with ten other families, which are in turn confederated into a corps of one thousand univitatia. 3. Achieve simultaneous adjustment to both fellow morontians and these host univitatia. Acquire the ability voluntarily and effectively to co-operate with your own order of beings in close working association with a somewhat dissimilar group of intelligent creatures. 4. While thus socially functioning with beings like and unlike yourself, achieve intellectual harmony with, and make vocational adjustment to, both groups of associates. 5. While attaining satisfactory socialization of the personality on intellectual and vocational levels, further perfect the ability to live in intimate contact with similar and slightly dissimilar beings with ever-lessening irritability and ever-diminishing resentment. The reversion directors contribute much to this latter attainment through their group-play activities. 6. Adjust all of these various socialization techniques to the furtherance of the progressive co-ordination of the Paradise-ascension career; augment universe insight by enhancing the ability to grasp the eternal goal-meanings concealed within these seemingly insignificant time-space activities. 7. And then, climax all of these procedures of multisocialization with the concurrent enhancement of spiritual insight as it pertains to the augmentation of all phases of personal endowment through group spiritual association and morontia co-ordination. Intellectually, socially, and spiritually two moral creatures do not merely double their personal potentials of universe achievement by partnership technique; they more nearly quadruple their attainment and accomplishment possibilities. 43:9.1 After graduation from world number seventy, ascending mortals take up residence on Edentia. Ascenders now, for the first time, attend the “assemblies of Paradise” and hear the story of their far-flung career as it is depicted by the Faithful of Days, the first of the Supreme Trinity-origin Personalities they have met. 43:9.2 This entire sojourn on the constellation training worlds, culminating in Edentia citizenship, is a period of true and heavenly bliss for the morontia progressors. Throughout your sojourn on the system worlds you were evolving from a near-animal to a morontia creature; you were more material than spiritual. On the Salvington spheres you will be evolving from a morontia being to the status of a true spirit; you will be more spiritual than material. But on Edentia, ascenders are midway between their former and their future estates, midway in their passage from evolutionary animal to ascending spirit. 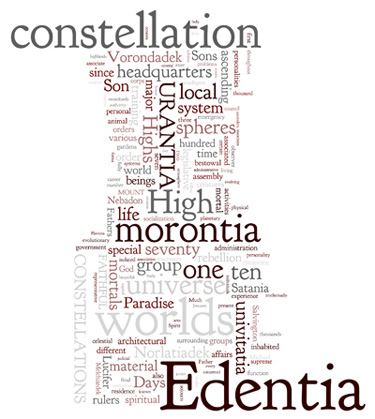 During your whole stay on Edentia and its worlds you are “as the angels"; you are constantly progressing but all the while maintaining a general and a typical morontia status.